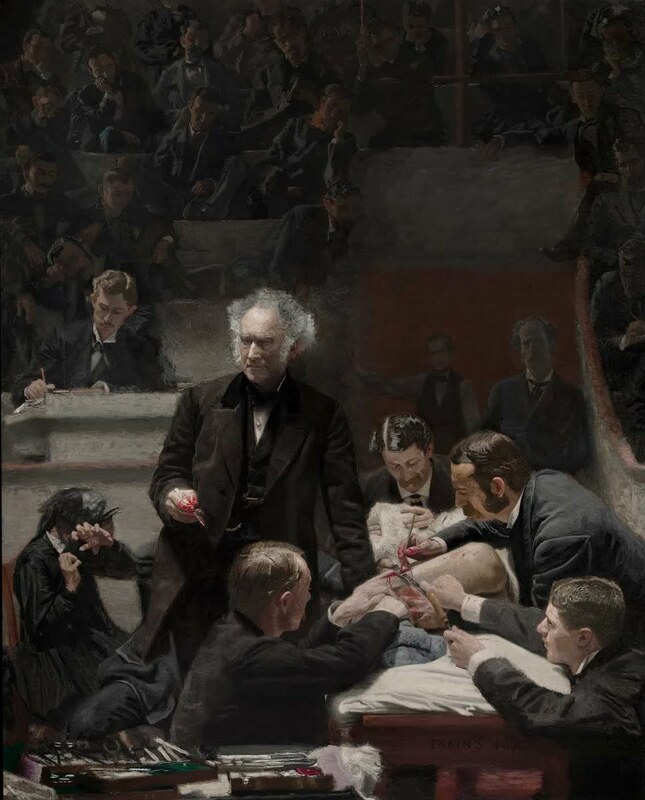 Thomas Eakins, a Philadelphia artist of severity and sobriety, approached the renowned Dr. Samuel Gross in 1875 with the idea of painting a portrait in the operating theater at Jefferson Medical College. Dr. Gross, an innovative surgeon of the day, pioneered the surgical technique depicted in the painting: saving a gangrenous leg by removing pus. “The painting was submitted in an art exhibition, but it was a little too bloody for their tastes,” Dr. Claman said. The intense realism and drama of the work shocked the art world and offended the public. But it also communicated a lot about how surgery was practiced in the late 19th century. “What you notice is that there were no gloves – those weren’t introduced until the 1890s,” Dr. Claman said. “There were no gowns or masks. And our dear Dr. Gross was not a devotee of Dr. (Joseph) Lister, who discovered the use of carbolic acid, launching the principle of antisepsis. He was kind of behind the times. The painting shows the medical school students looking on from the shadows, and a friend of the patient – perhaps his mother – recoiling in fear in the corner. The picture also has a unique Denver connection. In the 1880s, there were two medical schools in Denver. A third one was begun in 1887 by a student of Dr. Gross, and it was named Gross Medical College. In time, the school merged with the Denver College of Medicine, which eventually merged with the CU School of Medicine. Perhaps this is where we got the term "gross" anatomy from. Anyone know for sure? Is Boredom Good for You? Three's Company, Four's A Treatment Plan?